We all know that CES is currently being held in the US and many new gadgets and phones are bring introduced at the show. @BenThePCGuy from Windows Phone is there and he is running a challenge which is quite interesting. In this challenge called “#SmokedByWindowsPhone”, he challenges anyone who is up to see if their phone can beat the Windows Phone in speed. If the phone is able to beat the Windows Phone, then Ben will pay them $100 each, but if their phone is slower than the Windows Phone, they will have to admit that they have been #smokedbywindowsphone. Occasionally Ben gives out Windows Phones like HTC Radar, Samsung Focus etc just to make them happy. This was the introduction of the challenge. MUST WATCH! Now, check out some of the challenges that happenedat the CES show floor. I personally prefer the last video, but the others are fun to watch as well. So what do you guys think of this challenge? Leave a comment below. 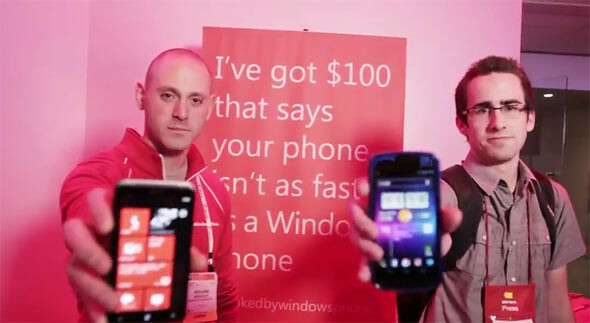 4 Responses to "iPhone 4S, Android Phones Get Smoked By Windows Phone In Speed Challenge! [video]"
Ben, I want to ask you what windows phone you are using? (especially on ICS) – on tablets I find it mediocre but love it on phones.